MACH100 switches are designed primarily for the control room environment and on the verge of the office world. They offer an operating temperature from 0C bis 50C at fanless cooling as well as low initial investment, high quality and durability. There are switches available with a fixed port number or as an modular workgroup switches. The possible option of SFP modules increases the flexibility to cope with changes in the network in the most efficient way. 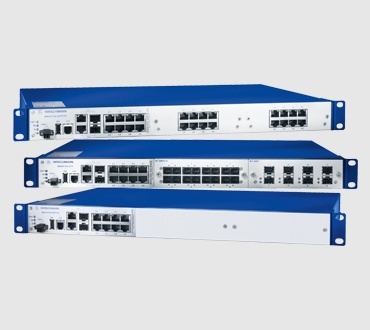 The MACH100 devices are managed Workgroup switches with up to 24 Fast Ethernet and 2 Gigabit Ethernet ports. They consist of a basic device and depending on the device variant - up to 2 pluggable media modules. They allow you to construct switched industrial Ethernet networks that conform to the IEEE 802.3 and 802.3u standards using copper wires or optical fibers in a bus or ring topology. You can connect terminal devices and other infrastructure components via twisted pair cables, multi-mode fiber optic and single- mode fiber optic. The twisted pair ports support autocrossing, autonegotiation and autopolarity.